Let me describe Affiliate Marketing in my own way, how I understand it and why I choose to become an affiliate marketer or blogger. I hope this will help you understand about Affiliate Marketing and helps you decide if it is for you. When I first joined the Wealthy Affiliate in 2015, my wife warned me that as one who has never been in the sales business before I should not even think of starting my own business – online or offline. She reminded me how we lost all our hard-earned money when we briefly got involved with stocks and shares, 20 years back. I explained to her that this is affiliate marketing and that I will not be selling anything. I will write blog posts that inform my visitors about good and bad products so that they become more verse and make the informed decision if they decided to buy something. My job is to generate and provide useful information for buyers. Sales people sell products using sales pitch to pressure you into buying them at the highest price possible. The products they pitch you to buy may not necessarily be what you want nor need. But they know how to get you into buying them. Marketing is different. Affiliate Marketing only provides people the product they are seeking for, and provide them with information and ideas to assist them to make a sound decision. There involve no sales pitch nor pressure. Surely, to become a salesman is not my dream. So, to make money online I opted for affiliate marketing, which resonates with my passion and hobby. Throughout my past life as a social and political activist, my passion has been helping others. So, doing affiliate marketing is, for me, another form of pursuing my life long passion. Reading and writing have been my hobby, so blogging is a perfect choice for me. In the past, I have experience in computer aided design, and I enjoyed it. So, designing websites wouldn’t be boring. Reading and writing have been my hobby, so blogging is a perfect choice for me. In the past, I have experience in computer aided design, and I enjoyed it. So, designing websites wouldn’t be boring. to help buyers make an informed decision for products they intend to buy. The affiliate marketer does not need to stock or keep inventory. You don’t need to purchase any product. Unlike the 9-5 rat race, you do all the affiliate activities from the comfort of your home. You do not need to commute back and forth between your home and workplace. There is no need to pay a dime to join any affiliate program. It’s free. If you are to pay for joining any affiliate program, avoid them, they are very likely scammers. You can have one or more websites and earn money sharing a variety of products. First and foremost, you need to have the knowledge and skill of website building. If you do not have this skill yet, you can learn from Weatlthy Affiliate University, where I myself have learned. This Open Education Program not only teached me all the nitty-gritty of web technology but also everything I need to know about Affiliate Marketing. Even if you already have the web building skill, it is still worth joining Wealthy Affiliate University to educate yourself about affiliate marketing. If you already have your own website, you still can acquire tons of knowledge about monetizing your website. You need to choose your niche, topic, theme or product you wanted to market from your website. Type in [YOUR NICHE] + Affiliate in the search bar of Google, Bing or Yahoo, and you will find tons of information. There you find companies which have affiliate partnerships for you to apply. Do the research and choose your favorite product. Apply for affiliate partnership with companies or vendors who manufacture and sell the products you wish to promote. Start blogging about your niche or product. Do thorough research about the product of your choice and try your best to become a knowledgeable expert so that you can promote it with an authoritative voice. Once your application is accepted, the company will provide you affiliate link(s) to be placed at any appropriate place on your website. The affiliate link(s) will have embedded code(s) specific to you and your account as an affiliate publisher. When visitors to your website click on your affiliate link(s), they are redirected to the web page of the vendor or company where the sought after products are available for sale. When the visitor makes a purchase(s) you earn a commission on the sale. Once you become an independent affiliate marketer of a certain affiliate program you will be asked to provide some sensitive information, like your social security number for tax purposes, bank account information and address for direct deposit payments etc. Be prepared before you provide this information and make sure your website is safe by installing SSL. 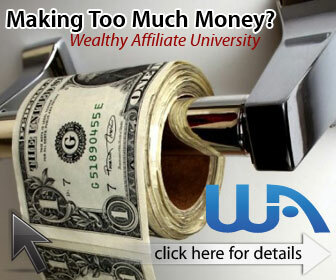 If you wish to enter into the real affiliate world, you can join me at Wealthy Affiliate University, which teaches people like me and you the honest way of earning legitimate income through affiliate marketing. This is the place where I learned how to build websites and this website is the best testament of how I have progressed since I joined them with zero knowledge of web technology. Joining the network is free, though there is an option for upgrading, if and when you are definitely sure that the network is for you. I know you will be satisfied like me with the tons of knowledge you will acquire from this network. Any question, or comment please do so below in the comment box.